1. DNA analysis indicates that gorillas and chimpanzees are more closely related to humans than to orangutans. 2. Gorillas are the largest primates on the planet-males can weigh between 350 and 450 lbs and females are about half that size. 3. Gorillas laugh when they are tickled and cry when they are sad or hurt. 4. Gorillas rarely drink water, they obtain all the moisture they need from the plants they eat. 5. 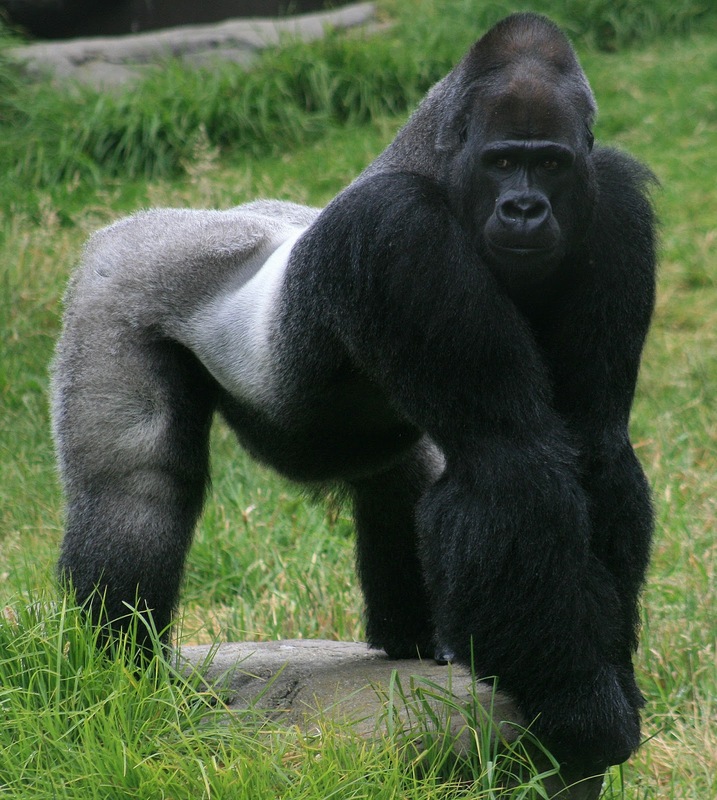 Male gorillas can eat up to 50 lbs. of food per day. 6. Gorillas use vines, branches and leaves to form new beds every night. 7. A newborn gorilla weighs approximately 4 1/2 pounds. 8. Gorillas generally live in small groups of about 2 to 20 animals but the largest group ever observed contained 65 individuals! Gorillas often stay with the same group for many years. 9. A gorilla will try to scare off intruders by standing up and pounding its chest-a behavior that is appropriately called a chest beat. Chestbeats can also be made for other reasons from a gorilla feeling good on a sunny day, to a gorilla showing off, to a gorilla warning someone that he’s there and watching. 10. Mountain gorillas were not discovered by Europeans until the 1902. 11. Gorillas have been listed with the Convention on International Trade in Endangered Species of Wild Fauna and Flora (CITES) since 1975. 12. There are two species and four subspecies of gorillas. 13. Gorillas live in the rainforests of Africa that are located along the equator. 14. Mountain gorillas can be found at elevations of up to 4,000 meters (13,000 ft) in the mountains of central East Africa. 15. Gorillas are quadrupedal, meaning they walk on all fours. They walk on the soles of their back feet, but curl the fingers of their hands under and walk on their knuckles. Walking on their knuckles provides strong support for their long arms, and their massive arm, shoulder, and neck muscles.